Credit and thanks to Peter Mello for this mystery contest; check out his great site.
. . . so this guy walks into a bar and says he’s just back from lassoing polar bears that he sells to the Bronx Zoo. (Oh, and I have to own up that I’m myself lost in a time warp. It’s the late 1920s. Please buy this premise from Tugster.) Here’s a gratuitous sail foto. Yeah, so he sees I’m not buying his story. So he continues . . . telling how they pulled these lassoed polar bears back to the schooner behind dories, genuine fishing dories like the ones used for Grand Banks fishing. (oh, and he has by this time introduced himself as Carl Dunrud.) 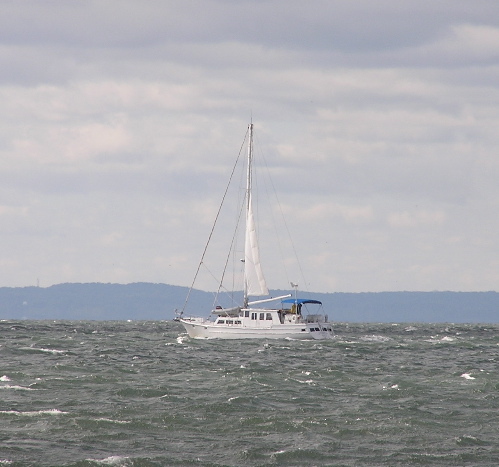 Time for another gratuitous blustery sail foto, both taken near the Narrows with Staten Island and Raritan Bay in the distance, respectively. So, I haven’t signalled the bouncer yet, and he goes on to say he’s building a mountain hideaway for Amelia Earhart–my hero! !, scroll thru–to “crash” in when she gets back from her round-the-world aeroflight . . . Question is below these actual Dunrud fotos. 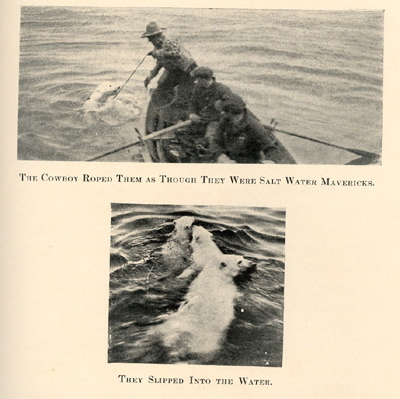 Some novelist should pick up these fotos as ideas for a 20th-century Moby Richard, or the White Bear. Mr. Pynchon, isn’t this compelling? Here’s the question: What schooner, still afloat in 2007, was the platform for this bizarre “fishing trip” ? What other “second lives” has this schooner lived? These are not doctored fotos; the clues above, which you might have thought zany, are real . . . well, except the part about my having been in a time warp. 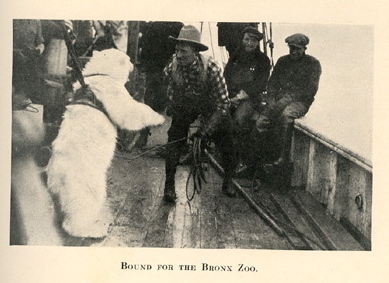 I do wonder, given that these bears came to the Bronx Zoo, whether the schooner did the delivery. And what victuals would have nourished it? First one to answer correctly gets to propose his/her own mystery. 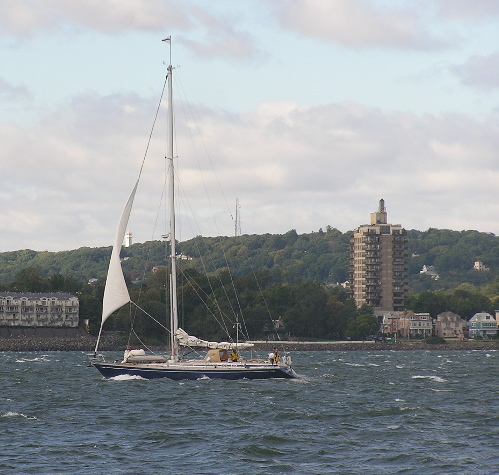 The schooner that Carl Dunrud sailed on was the Effie M. Morrisey, known today as the Ernestina (www.ernestina.org).